Love the thought and convenience of cruising right from Manhattan to your destination but don’t like the hustle and bustle of the big city port? Now you have a great choice, right across the Hudson, when you choose the Cape Liberty Cruise Port in Bayonne, New Jersey. Cruises to Bermuda from New Jersey are just one of the destinations available when you pick this port for your next cruising adventure. Both Royal Caribbean and Celebrity cruise lines use the port at Bayonne, where you will find plenty of parking, ample room for drop offs and pick-ups and a friendly atmosphere that can only be found in the smaller cities. Of course the option is always there to take Bermuda cruises from New York, but with the flexibility, easy access and easy commute to New Jersey, why would you? Cruises to Bermuda from New Jersey take you on a breathtaking journey through the harbour where you can see the Statue of Liberty, the incredible skyline and go under the Verrazano Narrows Bridge at the start and end point of your roundtrip. With so many things to do in Bermuda, like golfing, shopping, sightseeing and of course relaxing on the pink sand beaches they are famous for, Bermuda is a lovely cruise destination. Making the most of the sights along the way is afforded you when you choose the New Jersey port as your embarking point. Cruises to Bermuda are usually between 4 and 8 nights in duration, and with nothing but open seas to your destination, you can take in all the glorious amenities that your ship has to offer. Both Royal Caribbean and Celebrity make sailing a great alternative to flying with their fine dining, onboard spas, and world class entertainment along with fun daytime activities on their floating cities. Cruises to Bermuda from New Jersey take the stress out of the beginning and end of your cruise and make a smooth transition for you and your party from home to vacation to home again. 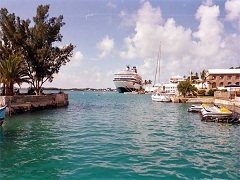 Make your next Bermuda cruise vacation a fabulous affair from start to finish when you choose Royal Caribbean or Celebrity cruise lines and book your get away from the great port of Cape Liberty in Bayonne. Far enough away to be different though close enough to New York for the sights of the big city, cruises to Bermuda from New Jersey checks all the boxes.